There is something enchanting about Southern snow. The bleak, russet landscape suddenly draped in winter white. As if under the spell of a soothing lullaby, the earth is still and quiet, tucked safely under a blanket of snow. And we, the lucky spectators, hold our breath, taking in this magical, rare moment. A mix of snow and ice gently crunch and squeak under our boots as we venture out into our own little tundra. Michael dares to glide across a glassy puddle, completely frozen, or at least he thought so as the muddy pool began to give way to the weight of his body, shattering like thin brittle underfoot. I shrill, giggle and stomp my feet in vain, attempting to get warm. My entire face has become completely numb and delirium has possibly set in at this point. I wave down my adventurous husband and declare (only with my eyeballs mind you) that it’s time to go home. As I sit in the warmth of my loft, I begin thinking about how baking and Southern snow remind me of each other. 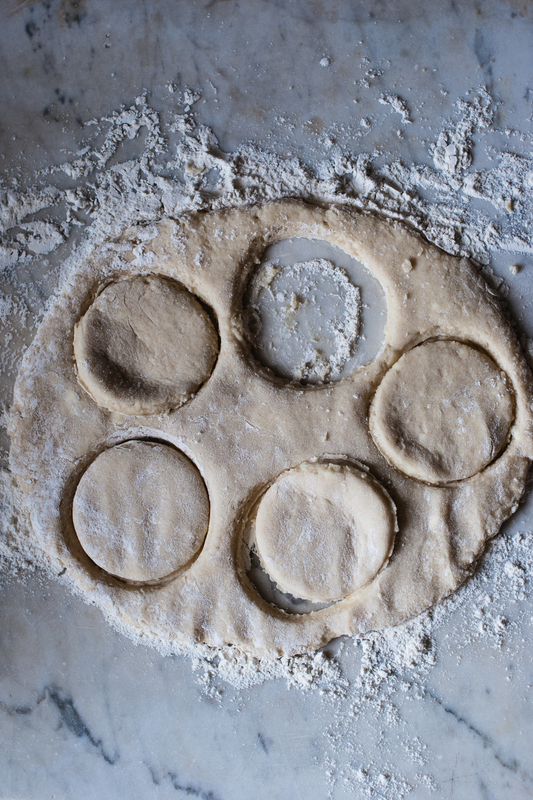 Soft, white puffs of flour rise and fall as I cut out rounds of dough, which resembles the powdery snowflakes frolicking right outside my window. A blanket of snow retells of the tender hue of buttermilk streaming over all living things, nourishing them. Then there is the sweet steam that wafts and waves from a freshly baked good, much like the steam that lifts from my lips in the icy cold air. Both wonderful. Both magical. Both have the ability to give great joy and warm the heart in its own way. And I rest here with my piping hot scones, savoring my sweet day spent in the Southern snow. 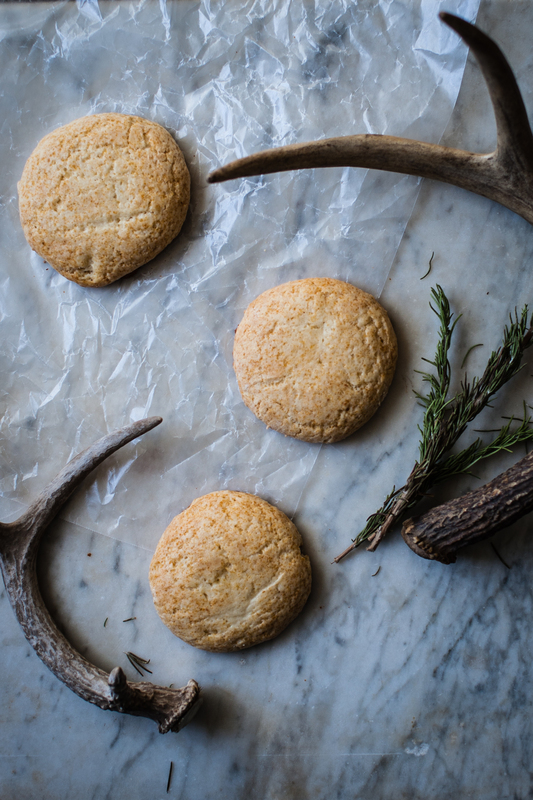 Note: If you have made biscuits before, you can make scones. 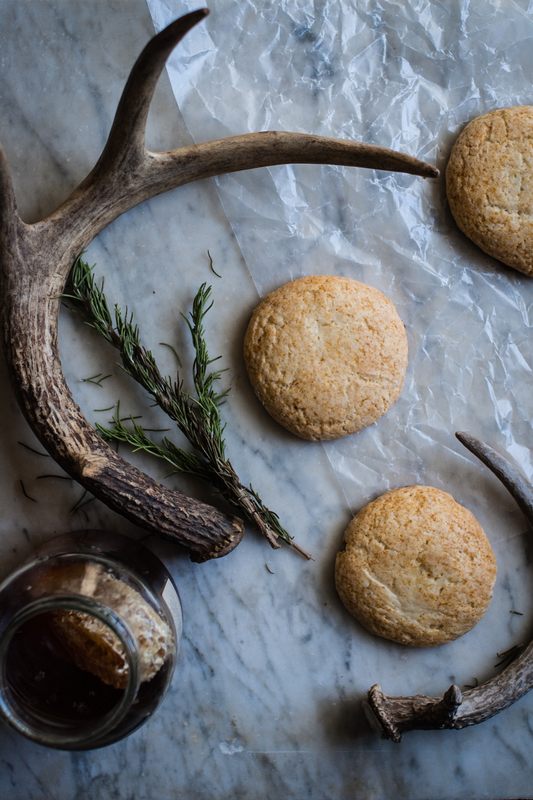 Scones are really a sweet biscuit if that helps! Whipping honey intensifies its floral taste. Just place the honey in a mixing bowl fitted with a whisk attachment and whisk on the highest speed for 10-15 minutes. If you don’t have time to whip the honey, you can certainly use honey straight out of the jar for this recipe. Also, you can use two knives or a pastry cutter to cut the butter into the flour, but I enjoy using my hands and being able to feel the mixture coming together. Whisk flour, baking powder, salt and sugar together in a mixing bowl. Whisk ¾ cup of buttermilk and honey together in a small bowl, just until the honey is incorporated into the buttermilk. With your fingers rub the butter into the flour mixture until there are no pieces larger than the size of a pea remaining. Stir in the buttermilk and honey mixture with a wooden spoon just until combined. 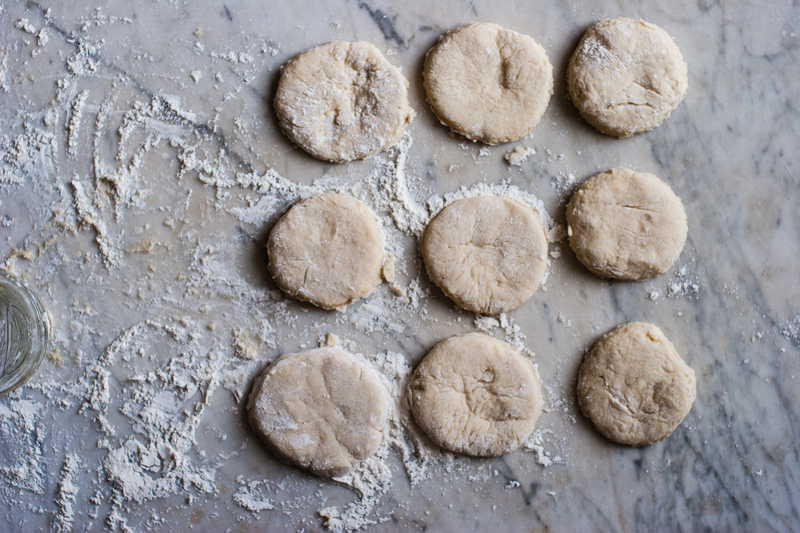 Place on a parchment lined baking sheet and brush the tops with more buttermilk. Bake for 10-15 minutes, or until the tops are golden brown. Enjoy! I love honey scones! These sound perfect. Thanks so much! I love a sweet scone because it can serve as a breakfast or dessert! Such beautiful post! You are fortunate to have a taste of white winter, here, across the pond it’s been rain over and over again. Lovely scones! Thank you so much for the kind words! It was a rare and wonderful moment! What a lovely post, and such gorgeous, mood-capturing photos to go along with them. I completely agree with you that there’s something charming, mysterious, and almost majestic about Southern snow that you don’t get anywhere else (least of all in slushy New York). I miss the snow days of my childhood 🙂 Thank you for this, and these scones sound divine! You are too kind! Waiting for snow in the South is like waiting for Christmas morning. It makes you feel like a child again. There is something lovely about that! Thanks for sharing! Such a beautifully written (and styled) post. White snow and ice has something truly magical to it. Thank you so much! I completely agree with the magic and wonder in it all!